A sirloin tip roast is marinated in dry red wine before it is rubbed with seasonings and then roasted to perfection. 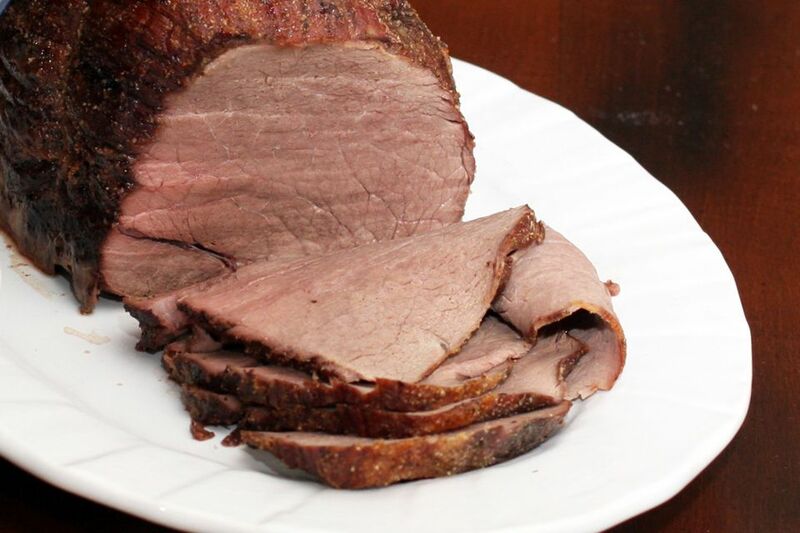 It's a basic roast beef recipe, and it is an excellent choice to serve with mashed potatoes. This oven roast is made with a little red wine and a variety of dried herbs and seasonings. If you like gravy with your roast beef, see the easy optional gravy below the recipe instructions. About 2 hours before roasting, combine the roast and red wine in a food storage bag; refrigerate. Combine remaining ingredients in a small bowl about 10 minutes before roasting time. Take the roast out of the wine marinade and place it on a rack in baking pan. Rub all over with the herb and seasoning mixture. Roast at 350° for about 1 to 1 1/2 hours, or until roast is about 135° on a meat thermometer for medium-rare. Put 2 tablespoons of pan drippings (or use butter) in a saucepan and place it over medium heat. In a cup or small bowl, combine 3 tablespoons of cornstarch with 3 tablespoons of water and mix until smooth. Add to the drippings and whisk to blend. Add 2 cups of low sodium beef broth or unsalted stock. Serve with the roast beef.